After 2 nights at the glorious Hotel Taiwana we checked into villa WV RKU which was ours for a week. What a lucky draw that assignment was. WV RKU was wonderful - good location, attractive, good linens, comfortable beds, I loved my bedroom and miss it now. I have total confidence in our on-island colleagues that my clients fall into the best possible hands when they arrive in St. Barts. That coupled with the monstrous cool factor of the island ensures a great vacation experience. Pretty much across the board, the villas are in great shape – the gardens are so beautiful and the villas are clean and sophisticated with TVs and espresso machines and Wi-Fi. 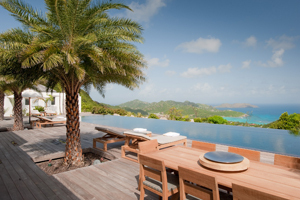 Our goal on this trip was to get to know the new villas on the island and to revisit those that we hadn’t seen in a while, all so we can provide you, the client, with the most current information for your next St Barts vacation. In all, we saw over 70 villas, so ask us about the views, the décor, the linens, anything that’s important for you when renting a villa. Villas WV ECO and WV ECG are 2 new, luxury villas in Gouverneur. This is an opportunity to enjoy heaven on earth. 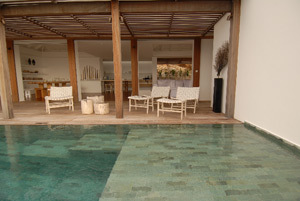 Each villa has 4 bedrooms and rented together could accommodate a group of up to 16. Villa WV CNG is a little treasure. There are 2 bedrooms of similar size and a pool and Jacuzzi. This would be a great option for a family or 2 couples traveling together. I adore Villa WV MOZ with it's dramatic and very private Pointe Milou location. Some of our team was staying at this villa so I was able to spend a few hours there which was very enjoyable. Visual: The colors are remarkable - the orange flamboyant trees and the blue Caribbean Sea. If you like blue, this is the Mt. Everest of blues. We saw hummingbirds, lizards, several types of iguanas and plenty of the island tortoise. We also saw 2 peacocks and 2 hens out having a stroll in Pt Saline. Touch: We swam at Flamands beach and Gouverneur. The water was warm and heavenly. Smell: Occasionally you walk into a pocket of fragrance from night blooming jasmine or plumeria. The aroma of BBQ or a bakery might catch your attention. Sometimes you are lulled by the beautiful products on your skin - the clean smells of Genie hand wash you can buy at the store. Taste: already covered that one. Another taste - salt on your lips after a swim. Sound: wind, airplane engine drone, morning doves, roosters, peacocks, at night the frogs. Trends flow through the island year after year. 8 years ago it was smart cars. 5 years ago it was the diamond genesis st barths map bracelets. Now? Pearls. You can buy a pearl bracelet at Fabienne Miot on Rue de la République in Gustavia for 50 euros and up. This pearl can be pink or yellow or black and are generally river pearls, not so expensive. You can also go to the better stores or the jeweler called Biloux de la Mer which is just across the street. They feature black pearls from Tahiti and is well worth a visit. The pearls are very pricey but shimmer in the light and are exquisitely beautiful. The store was established by Maryvonne and Gerard Mignot who lived both in So Africa and Bora Bora while raising 9 children. She designs the jewelry and the shop is run by her daughter and a granddaughter. All of them are beautiful and friendly. This was a great reaffirming trip. I love the feeling of being on the road in the very spot where it all happens and to have the chance to be closer to the experience we arrange.